With Tech One Global as a minor sponsor, MAP spearheads a forum to help companies in securing this generations new oil — data. 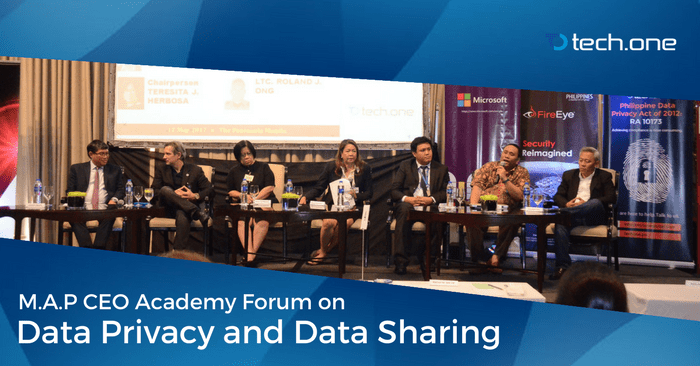 Last May 12, 2017 — Tech One Global Philippines sponsored a successful forum: MAP CEO Academy Forum on “Data Privacy and Data Sharing” with the theme of “Working Together to Achieve Inclusive Prosperity” held at The Conservatory, The Peninsula Manila. In a rapidly evolving digital age, data privacy and security are two concerns that most people are skeptical about. As information gets bigger and its channels faster, it is no surprise that information breaches and security concerns will also arise. Cybercrime is in every corner of the internet. Just this week we saw “WannaCry,” one of the worst cybercrime in history, paralyze the whole world. This proves that no institution, no matter how strong, is invulnerable to cybercrime and data breaches. This is the main point that Marife Zamora, MAP Preseident, wants to establish. Even the impenetrable Pentagon also had its share of data breaches. With that in mind, the event focused on how corporations and even individuals can protect themselves from digital threats. The forum highlighted precautions and safety measures against data breaches, how to do assessments, how to respond from inevitable attacks, and how to recover after crisis. The event launched with a talk on the role of MAP for the continuing education and sharing of the latest technologies and information of management and leadership among our members and other management practitioners. The event also tackled RA 10173 or the Data Privacy of 2012, a law that pushes information controllers both private and public to coordinate with the National Privacy Comission (NPC) when breeches happen. NPC Commissioner, Dondi Mapa, also shared his thoughts on the issue. He thinks that a hundred years from now, we will look back at these years and celebrate it as a time when the first efforts toward data security was established. Teresita Herbosa, Chairperson of the Securities and Exchange Commission (SEC) also agreed to this statement and shared her thoughts on proper data management. She considers SEC as both a processor and controller on personal sensitive information. She believes that rules and systems are required to process and share the information or database in accordance with the data privacy act and its rules and regulations. Meanwhile, Jaime Casto Jose Garchitorena, President and CEO of CIC, described information as “the fuel for progress.” To him, information is the newest resource that drives development and that expending resources for it should be a no-brainer. For the CIC, protecting data and shielding it from unauthorized access is integral in protecting its quality and integrity. As one of the pioneers of digital transformation, Tech One Global supports new policies and systems to keep data safe. In rapidly innovating world, data will jump in value and the security needed to preserve it will increase tenfold. Tech One Global is ready to give its full support in pushing an age of a secured digital industry.